Let’s face it. We’re getting older. Hormonal declines, free radical damage, and environmental impact all play a part in the aging process. Starting in our twenties, these forces combine to steadily reduce efficiency in the functioning of our bodies. 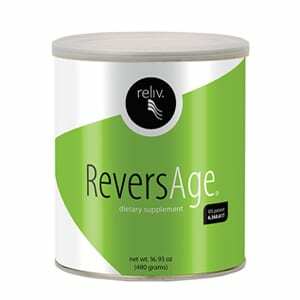 Now the good news: We can get better with age with ReversAge! Studies show that with healthy lifestyle choices and optimal nutrition, we can lead more active lives at any age. The age-defying, restorative formula of ReversAge supports the body’s production of key hormones that tend to decline with age. Antioxidants help slow the aging process within the body’s cells while bioflavonoids help protect and enhance overall wellness. ReversAge incorporates three proprietary complexes to address aging at every level, creating balance in the body’s major systems and enhancing overall wellness. A U.S. Patent There’s only one ReversAge. Three proprietary complexes — longevity, antioxidants and herbs — with the most complete array of restorative ingredients available in a patented formula It addresses aging at every level, creating balance in the body’s major systems and enhancing overall wellness. Symbiotropin® It battles hormonal decline by promoting the body’s release of its own Human Growth Hormone (hGH). GPC You’ll help optimize your mental focus and memory. SAM-e It supports mood and joint health. CoQ10 You’ll receive a powerful antioxidant that supports overall health throughout the body. Protykin® You’ll get heart and cell-protective benefits similar to those derived from red wine. Ginkgo Biloba It supports cognitive function and helps reduce pain. Maca You’ll enjoy improved energy levels, vigor and stamina. Chlorella It helps carry oxygen around the body and to the brain. * Disclaimer: The statements contained in this material have not been evaluated by the Food and Drug Administration. The personal testimonials shared reflect individual experiences and are not necessarily typical of the results you may obtain. Reliv products are not intended to diagnose, treat, cure or prevent any disease. How much should I take daily? Suggest one scoop daily in the beverage of your choice an hour before bedtime. A delicious lemon and lime flavor. Can I mix with other Reliv products? ReversAge is recommended to be taken separately in the evening. How soon will I see results? Nutrition directly affects the daily functioning of our bodies. Everyone’s body is different as to how much they need nutritionally and how quickly they will see results. Better skin, nails, improved energy, improved moods, relief from minor aches and pains, better sleep, more productivity, and mental clarity are just a few results that people notice. People are seeing results in numerous areas of chronic health as well. Remember that healing is a process, and new benefits can often be seen even after several months on the products.